I have been through two moves in the last year from the ranchito, plus losing my horses by sale and mortality, so my time has been constricted for writing on projects I desire. I want to come over and see your poetry site. There’s nothing better than standing in an autumn field, picking up two pecans, and cracking them against one another. In time, someone will do that from your trees — maybe even you! I hope so. It kind of helps to think something I planted today will benefit others in the distant future. Hope all is well with you down there and the rain has let up a bit–if that is what you want. Now that the Brazos is back in its banks, and the San Jacinto, all’s well. We were getting dry, but new rains have perked things right up. I’m starting a new school year, myself. In September, I’ll be training as a volunteer at Armand Bayou Nature Center, and in January, I’m beginning the course to become a Master Naturalist. I’m going to be part of the Brazoria County chapter — I’ve already spent so much time at Nash Prairie and the various refuges there, it feels like home. It’s good to appreciate the natural world, but helping others do so, too, is important. I guess it’s my version of planting pecan trees. Your training and Master Naturalist course sounds so interesting. I must look up Nash Prairie and the Nature Center. I am glad the rivers are within their banks again. I cross the Brazos when I go out to the Far Field and always note its level. Right now it is running quiet. There is nothing like fresh pecans. That’s so true, Bill. I remember shelling pecans and the stain on my fingers. 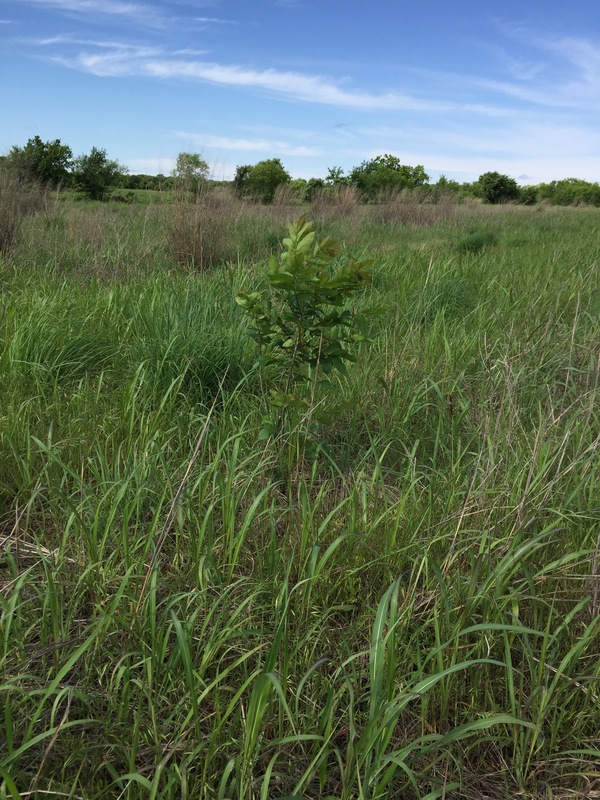 This small tree is one of four that I have let grow in the Far Field. I’ve been reading some of your comments on FB.